Mum and Dad live five minutes by bicycle from Stanley Park. Stanley Park is a 400 hectare peninsula on the north-western tip of the city. It has forest and woodland, with lakes and beaver ponds (and beavers) and open parkland. The Vancouver aquarium is located there, (currently mired in a controversy over the housing of two beluga whales. )and outside the aquarium, there are beavers and deer and coyotes and raccoons... 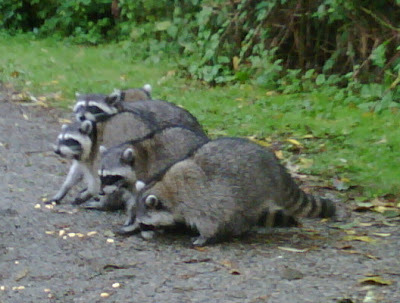 Boy, does the park have raccoons. Just on dusk, Dad would take me cycling with him in the park. Vancouver has a highly particular cycling etiquette. The city's trails are double-barreled. One lane for cyclists and other wheeled travelers and one for pedestrians, with a concrete divider down the center, so that we obstreperous cyclists don't get any wrong ideas and try to take out a pedestrian. Not for their want of trying - the road rules are clear and simple and rigid. Cyclists and skateboards and roller blades stay in their lane. Pedestrians walk anywhere they darned well feel like. Often with their eyes closed. "Let's check out the Raccoons!" Dad shouted one night. We were bowling along the shoes of Lost Lagoon, merrily dodging jaywalkers out for their evening constitutional. He swung sideways and slewed off the bike track onto a narrow dirt trail that led off into the brush. "They'll be out about now!" I skidded into the turn behind him. The track was damp and muddy, pressed in on both sides by low-hanging undergrowth. Four beams of light shone from the bush on my left. "That's two!" I called out. "Yep!" Dad shouted back. "Keep going!" We barreled down the trail, skidding around the turns and throwing up a wake of gravel and muddy water. Dad braked to a sudden stop. "There!" A small stream made a break in the undergrowth, and in a clearing on the bank were eight fat raccoons. They looked up at us indifferently, then turned back to whatever had been absorbing them before we arrived - heaps of crushed dog kibble that someone had laid in a row all the way across the clearing. With unbecoming delicacy, the animals picked at the food with their slender, almost-human-like hands, and proceeded to stuff their faces. The whole lot of them were overweight - those delicate paws rested on noticeably rounded stomachs, and as, one by one they yawned and burped and left the piles of food half-finished on the verge and headed with an asthmatic waddle back toward the stream, low-slug bellies swung ponderously back and forth sideways. Ten meters further down the trail we found another gang of overfed creatures, and then another - all told, we saw seventeen well-rounded raccoons while travelling slightly less than thirty meters of parkland. "This is nothing." Dad sighed. "One evening last week I saw thirty three."